I had recently purchased two vintage Trek bikes from a local CL seller. He had this white Bianchi with cantilever Mafac brakes. I wasn’t interested in this bike originally but after a few days I went back to look at it again and found it wasn’t one of the average Japan made touring frames. This frame is stamped on the seat post colar, has a 170mm wide Italian threaded BB. It’s the 076th frame built in January 1983. 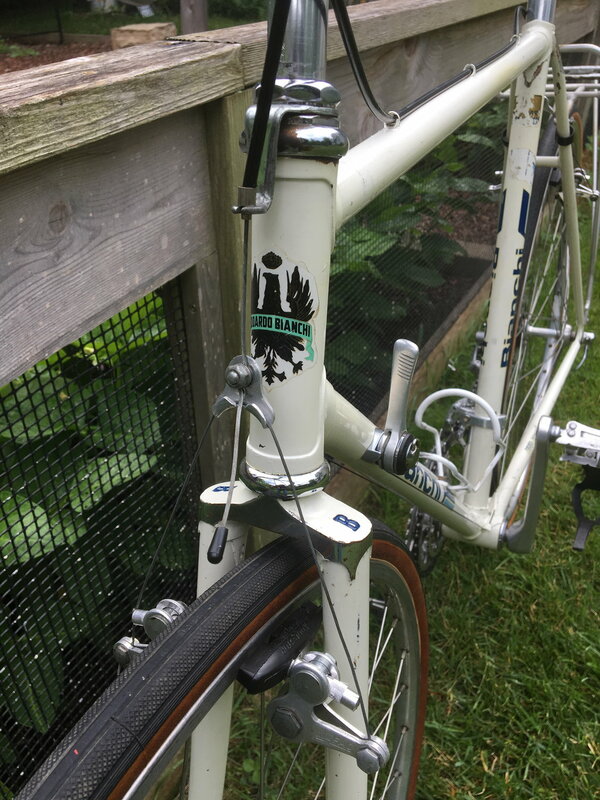 The frame has a Made in Italy decal on the lower part of the down tube. 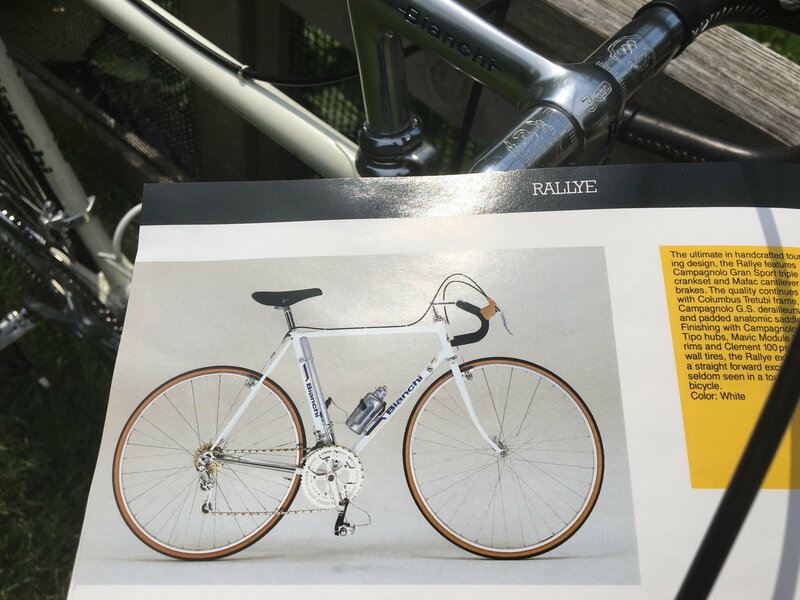 Seller had the original Bianchi catalog and we were able to ID the bike as a Rallye. It’s not in mint condition but looks rideable with a much needed tune up. Upon quick inspection, no dings to tubing, paint is decent and No Stuck seat post or stem. Missing some original drive parts but it’s 75% complete. I didn’t need another bike or project so for now I’ll just hang it in the garage while I slowly aquire the missing components that should be on there originally. 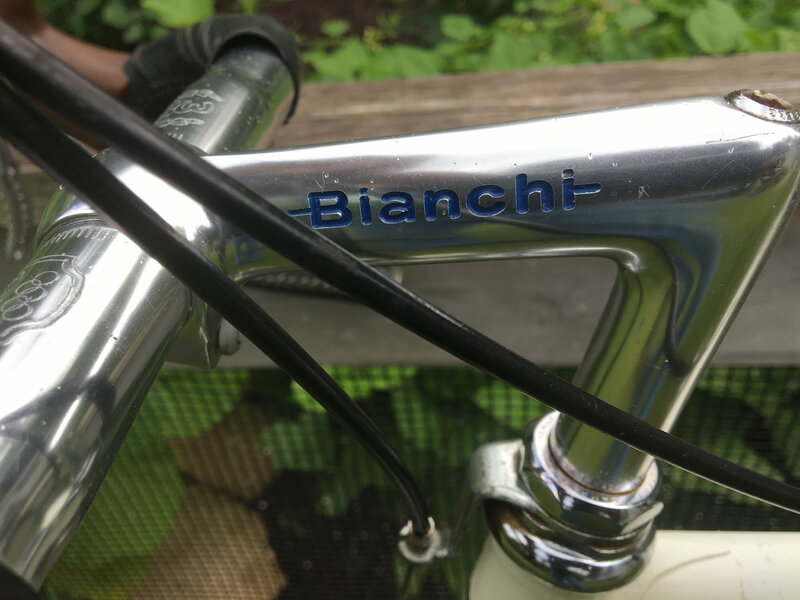 I tried to research this model Bianchi and found little information on it. Anyone else have one of these and how well do they handle? Nice unique find. Looks like a classic Euro sport-touring/winter-training/cross bike but with a triple crankset & cantis for the mountains. I don't have one but did own a couple of 80's Italian/Columbus road-racing frames with similar geometry & they handled great: nimble steering, fairly comfortable, confident on descents & bumps. I esp like the Rallye fork with the elegant Italian-style crown & bend. 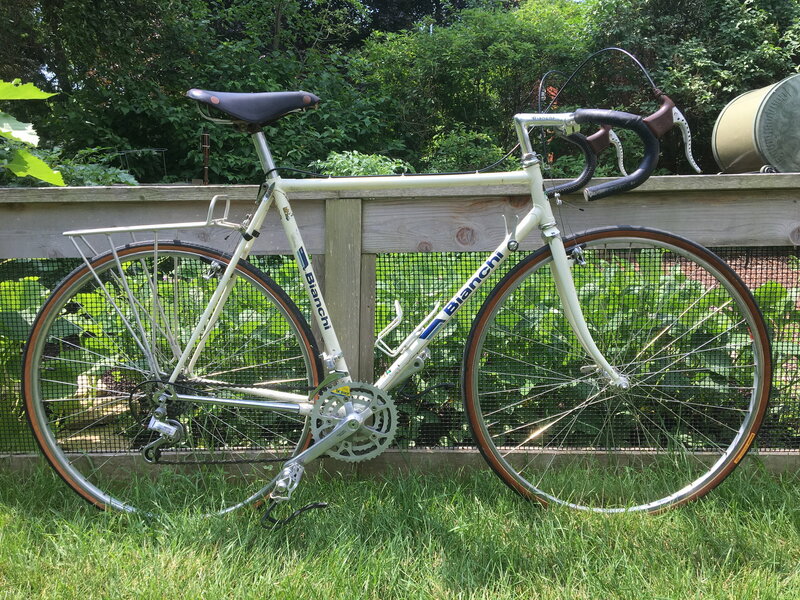 I have an early 60s Italian Columbus tubing bike, rides great and handles very nicely. But, I really do not like friction downtube shifters on front and rear so I rarely ride it. For someone that likes (or at least does not mind) friction downtube shifters, this might be a nice rando bike or credit card touring bike. If you do not feel a need to keep it original, if the rear dropouts are spaced at 126mm, you might be able to put a cassette type wheel with 130 mm spacing into the frame. 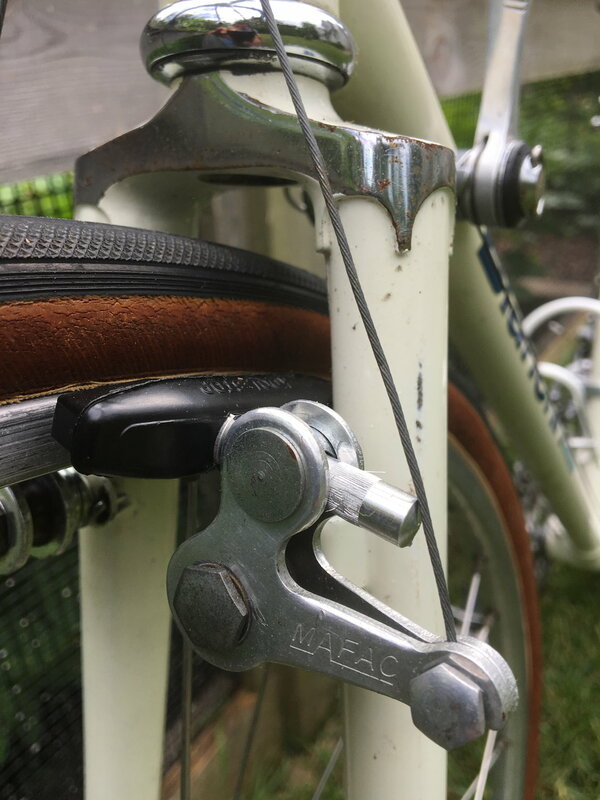 My vintage bike had 120 mm dropouts, I bought a used set of wheels that were 126 mm that would take a six speed cluster and am running those wheels. If you wanted to add a water bottle cage, these might fit depending on your tubing size. Major score in my opinion. A few things is comes up with short on are it is lacking enough waterbottle cage mounts and some people would frown at the bio pace (oval) chainrings. The bottom line is that it is/ would make an really awesome touring bike. Thanks for the replies. I assumed the newish Biopace crankset was a cheaper replacement to the stock Campagnolo Gran Sport triple. It still has the Campagnolo BB cups so I’m assuming the spindle is campy. I’ll need to remove and inspect as it’s always good to re grease everything that’s been sitting. It’s missing some expensive drive train parts. The rear Campagnolo long cage Rally derailleur, Front Campagnolo G S derailleur and the mentioned Gran Sport triple crank. Those three items might cost more than I paid for the bike. I’ll keep an eye out for some not so minty parts, might be less expensive that way. I wouldn’t mind slowly returning it back to stock since it’s not going to be my rider. Merry Sales (Soma) has a long cage replica to fit on the regular N. record RD. Very nice! I would clean her up and love her forever if she was mine. ...It’s missing some expensive drive train parts. The rear Campagnolo long cage Rally derailleur, Front Campagnolo G S derailleur and the mentioned Gran Sport triple crank. Those three items might cost more than I paid for the bike. I’ll keep an eye out for some not so minty parts, might be less expensive that way. I wouldn’t mind slowly returning it back to stock since it’s not going to be my rider. 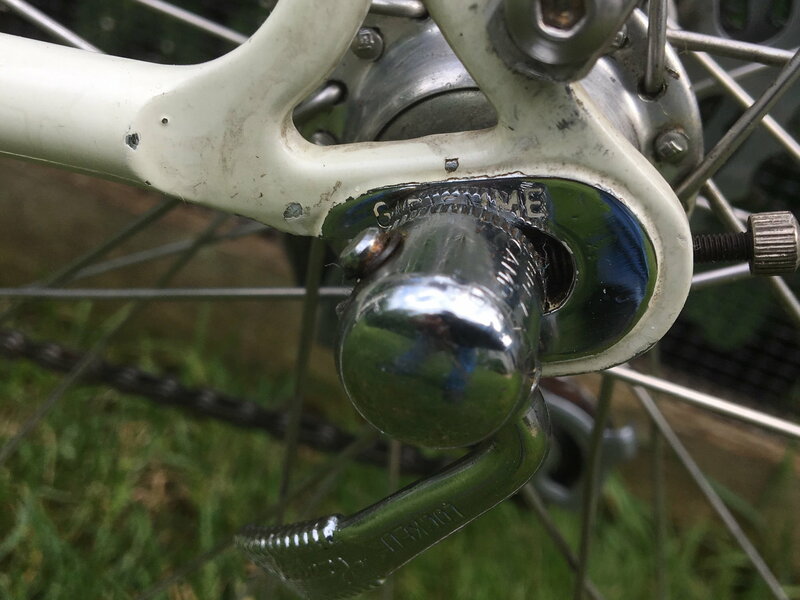 Good luck finding a Campy Rally rear derailleur for what I would call a reasonable cost, I do not think I have ever seen one sell for less than a hundred bucks (USD). Five speed cluster? I assumed it would be six speed by 1983. Interesting. 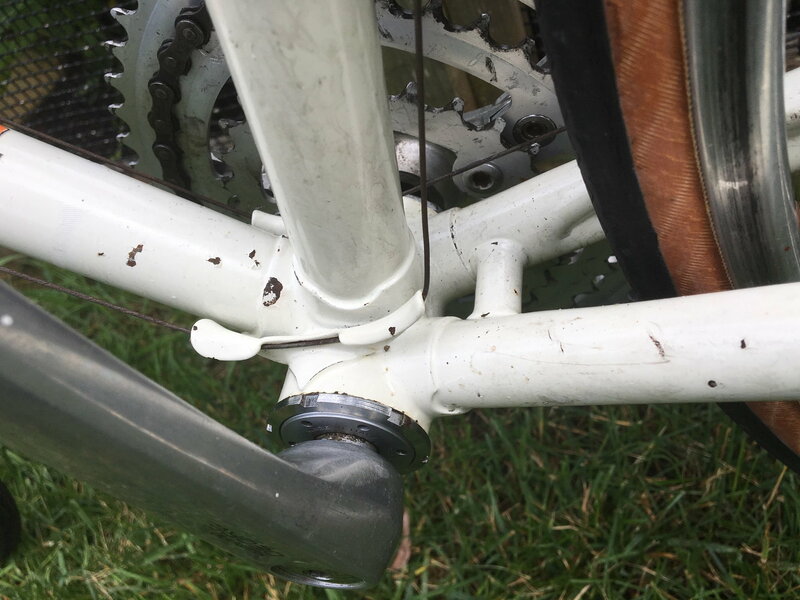 Five speed usually meant a 120 mm dropout spacing on the rear, not 126 mm. I previously commented that you could probably put a 130mm wheel in it if you wanted to run a cassette on it - but I am retracting that because I assumed you would be spreading it only 4 mm, not 10 mm. I could be wrong, perhaps it was originally 126 mm? I used to tell people that if it had a Campy seatpost it was a really good bike. They always looked at me rather oddly and asked why I concluded that the seatpost (which is not even part of the drive train) had anything to do with the quality of bike. I would respond that nobody bought a Campy seatpost after the fact to install on a used bike. Thus if it had a Campy seatpost, the bike came new with a Campy seatpost. And the bikes that had one when they were new were always good bikes. If you do not have the freewheel puller that fits whatever you have on the bike, that is something you will likely want to start watching for. Things like that show up at swap meets if you watch close enough. A couple years ago I bought a close to new Regina 6 speed cluster at a swap meet, but I had to stare at it for a while before I bought it trying to remember what freewheel pullers I had in my tool collection at home. Got home and checked, and yes, I had the one I needed. Makes sense esp since I'd guess it's more of a labor of love than resell money-maker. Those parts were pretty rare even back in the day. BTW I remember Bicycling Magazine guru Fred DeLong note that while alu-alloy cranksets were becoming standard, he really liked the Campagnolo Gran Sport triple. For an '83 bike I'd agree though in mid-70's Campy was about the only good truly micro-adjustable seatposts for a while so some folks installed them as an upgrade. 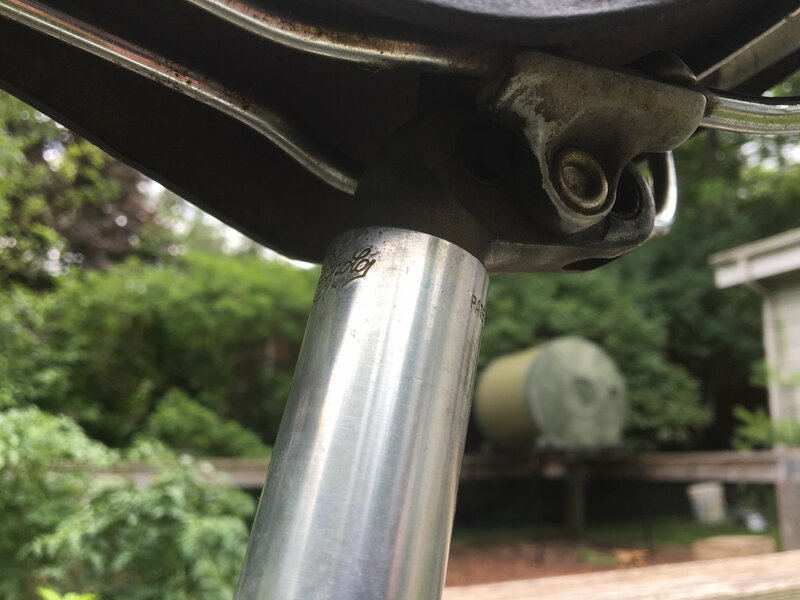 I worked in a fairly large bike shop in 1973, I do not think I ever heard of anyone buying a Camp seatpost as an upgrade. But I agree they were (and still are) nice. Maybe in your community the word got around that it was a useful upgrade? essentially dropped everything but the long slack take up cage..
used maybe the parallelogram face reading Rally, added on a regular NR Rear Derailleur ..
hence I mentioned 6th post ..
and that is what you see in the catalog picture at the head of the thread. Last edited by fietsbob; 07-17-18 at 12:48 PM. Interesting that this bike (and the other one of these here in BF) is different from the picture in the catalog. Note the bike has chrome showing on the seat-stay tips and fork crown, while the bike in the catalog has them painted over. Also the decals on the ones I've seen are Blue/Light Blue, while the catalog shows Blue/Gold. I wonder if they made this model in 1982 and it was slightly different. Also interesting that the catalog picture seems to show the crank with no dust caps. Sloppy but racy cool at the same time. Most likely Bianchi was rushing this odd bike out and didn't yet know what it was doing with paint and other details when the photoshoot happened. It's not really equipped for loaded touring - - brake bridge and fork crowns aren't drilled for mounting fenders or racks easily, single dropout eyelets and single bottle cage. Both bikes I've seen have the Specialissimma decal on the seat stay. I think this was probably factory. Everything about the bike says high-end: panto'd stem, exposed chrome frame. Only the tubing says otherwise and that's likely an effort to make it a little tougher. Otherwise, very similar to my Super Corsa. Last edited by artclone; 01-14-19 at 01:38 PM. Also noticed that the Rallye in the catalog photo has longer chain stays. Look at the spacing from tire to seat post. Also the lower chain stay chrome/white paint is spot on with the chain wheel but not with the rim distance. This makes the frame on the catalog photo appear longer. However this frame measured out to what is speced out for this model. I agree - those stays in the catalog are for sure longer, more in line with what you'd expect from a touring bike. Good catch. What is your sleeping setup?